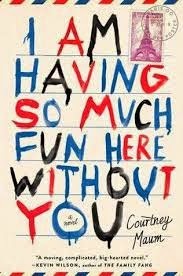 I really do like the cover of I Am Having So Much Fun Here Without You by Courtney Maum. The stamp and postmark and the familiar (well, to those of us who have/had foreign pen-pals) red, white and blue airmail envelope colors along the edges of the book made me think this would be a lovely story involving travel. While there was some travel (and letter-writing) involved, the main story was somewhat of a disappointment. Richard Haddon is a British artist living in Paris with his beautiful and successful French wife Anne and daughter Camille. He would seem to have it all, but no, he has to go and start an affair because (from what I can gather) he was just a bit bored. He ends up falling madly in love with the American Lisa, who breaks things off with him to move to London and get married. Richard, who was beginning to toy with the idea of leaving his wife for Lisa, is desperately depressed by the break-up. At the same time, some paintings he's done (but is not very enthusiastic about) have had a successful showing, but have left him feeling as if he's sold out. For some unfathomable reason, the departed Lisa has decided that she wants to keep in contact with Richard by writing to him, but he never writes her back. To keep the wife from finding out, the letters are delivered to the art dealer who shows Richard's work. Richard keeps the letters and obsesses over them. When the family goes to visit Anne's parents, naturally Richard takes the letters along. Shocker, his wife discovers them and throws him out. Naturally, once he's in danger of losing his marriage, Richard decides to turn his efforts into winning back his wife. There is a lot of back and forth with Richard and Anne and their arguments (he's really, really sorry; she can never trust him again, etc.) that gets rather tedious. Unfortunately, thrown into this domestic chaos is a long, long discussion of Richard's latest "project" -- getting an American washing machine and a British washing machine and having people bring things they want to "wash clean" -- using gasoline. It all ties in with a long discussion of the Iraq war and how the US and Britain were guilty of war crimes. The story contained lots of pretentious talk about "art" (some of it tongue-in-cheek, to be sure) and the people who make and view it. It was just really hard to get behind Richard or care much about what happened to him. He was wishy-washy in all areas of his life and tended to discard or ignore anything good (his wife, his successful paintings, etc.). The resolution of the story was also a bit abrupt -- a decision was made out of the blue and didn't seem to make much sense given what came before. I also wondered about who was buying the art "piece" consisting of two washing machines and a clothesline full of gasoline soaked items. Disclaimer: I received a copy of I Am Having So Much Fun Here Without You from the publisher in exchange for this review.